It’s summer! The season between spring and autumn, in the Northern Hemisphere from the summer solstice to the autumnal equinox, and in the Southern Hemisphere from the winter solstice to the vernal equinox. What’s the current reading at the McMurdo Station in Antarctica or in South Africa where the World Cup Soccer matches were held, where it’s actually winter? For those of us in the Northern Hemisphere, now’s the time for reading in those special places: while relaxing in the hammock, sitting in the shade of an apple tree with a glass of iced tea, or soaking in the rays on the beach! Do you have a book, magazine, or genre you like to read for fun during the summer months? What about the Little and Big Sister and other “Books For Walls” young readers? Maybe it’s a Ranger Rick magazine that comes camping with you! Or could it be a nature book about sea shells, butterflies on the wing, Petoskey stones, pirate or sunken ships - or a book you found on a vacation, at a nature center, or a relative sent from a science museum gift shop? 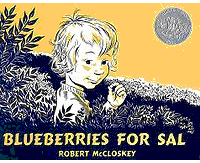 A favorite story which I bought for the Sisters in New Hampshire is "Blueberries for Sal" by Robert McCloskey, click here for more. A sweet story about a mother and little girl picking blueberries in Maine and their encounter with another mama and baby (bears)! Mr. McCloskey wrote several other award winning favorites including “Make Way for Ducklings” and “One Morning in Maine." His pictures as well as story line are endearing. My favorite quote of McCloskey’s is “I have one foot resting on reality and the other foot planted firmly on a banana peel.'' The NYT has a tribute to McCloskey’s life click here to read. Now, for us older folks -is your choice a romance novel, a tale about a far-away place, a selection of Neruda poems, a re-read favorite, or a book recommended by a friend! I have a re-read wonder on the top of my list: "Gift from the Sea" by Anne Morrow Lindbergh. Another read for me is "Caribbean Mystery" by Agatha Christi. I simply enjoy Miss Marple and Hercule Poirot and a good mystery. For those mystery buffs take a look-see at this website, there’s a “Christie Festival 2010” on England’s Riviera in Torquay. Anyone been there? Now share with us a favorite summertime book so that we might join you in reading your choice! Title of Book, Author, the name of your Favorite book or genre. Why do you like this for summertime reading? I have two books both by the same author Isabelle Allende. I love Allende's ability to spin history and facts into her stories. For adults: The Island Beneath the Sea This is perfect summer reading, nice and long, war, love, tragedy, history, beautiful dresses... BUT it is deep and leads the reader to think about what makes something right and what makes something wrong. The history of Haiti and Louisiana compelled me to want to learn more and I am --I will let you know where the book leads me. I LOVE this challenge, I will post again! Gilda is a girl who has amazing imagination, who can solve mysteries and loves to write on an old typewriter. It's very very exciting -it's the kind of book you cannot put down! It's about a girl and boy who were chasing a famous painting, it is a mystery book. If it was a movie it would have 5 stars!!! I can read it over and over and over. I will tell you, beach books are an interesting sort. You want something engaging, but not distracting. You need something that motivates you to wiggle your toes in the sand and better yet, want to jump up and really feel the (hot! )sand beneath your feet as you start to walk fast toward the water. You also can't mind if your book gets splashed, dropped in the water or pooed on by a seagull. It's a good question, but I am going to recommend reading Malcolm Gladwell's Blink (for those who are motivated to wiggle toes in sand via science and analytics), Kahlil Gibran's the Prophet (for the philosophers who haven't taken the book to the beach yet) a notebook and a pen (for the poets) and a Rough Guide (to the next place you are gonna visit for the planners), on the beach. Note: this is also a great reading list for the beach. What a lovely complement to the BFW project!! Celebrating the reading of our treasured texts in the great outdoors!! Since it is the 50th anniversary of To Kill a Mockingbird, I am reading it again. It's been a lonf time since I read it, and I am really enjoying it! "This heart-wrenching, coming-of-age tale set in a South poisoned by virulent prejudice, has been translated into more than forty languages, sold more than thirty million copies worldwide, served as the basis of an enormously popular motion picture, and was voted one of the best novels of the twentieth century by librarians across the country." I am a sailor... speed and smarts has strategies and tips that are helpful in the competitive feild for any kind of boat. This summer I am deep into Arthurian legends - most of which means rereading. This is due to an extended funk, aided and abetted by the weather. To help myself I asked, "What could I read that would distract and engage me?" The answer was, "Start with 'The Mists of Avalon' and see what happens." It worked; so I went on to Marion Zimmer Bradley's next novel, 'The Forest House'. Then to 'Hawk of May', Kingdom of Summer", and 'In Winter's Shadow" by Gillian Bradshaw. I just finished John Steinbeck's 'The Acts of King Arthur and His Noble Knights' and was really captivated by his letters, published as an Appendix (which I hadn't read before) that chronicled the years of research and travel and ups and downs he was going through to try to get the manuscript to where he wanted it to be. There are many more books on my "Arthur" shelf but perhaps its time to leave Camelot and environs for a while. I'll know better when I give it a try. In the meantime, it's good to know that this "healing" place still exits. Something I've enjoyed delving into this summer is the Mother Earth News magazine and all of it's myriad electronic DIY, and other tidbits. This is a 'new' to me summer read... something that fits into the life I am cultivating. It is a resource with practical how-to's that complement and inspire. My parents subscribed to this piece, even during the years when dollars were few & far between. It was a staple, like the Foxfire series books, and maybe somehow, my subscription this year was in celebration of the life I am living & the way it outlines, in many ways the life I was shown to live. Another favorite 'zine (to be read any time of the year) is The Sun. I cannot say enough about what it has meant to me as an individual and what I believe it shares with our world. The same is true of Utne Reader & Mother Jones. If I could afford it, I'd subscribe those four resources to every single person that I love. one for adults: Here on Earth --easy to get pulled into loads of relationships and angst -a great summer read! one for children: Aquamarine --nothing like the movie. Very short and sweet. You could easily read it in one afternoon on the beach.